ModBook Inc started taking preorders for the ModBook Pro, this new tablet is basically a 13.3" MacBook Pro modedd into a tablet-style computer with an Intel Core i5/i7 processor, up to 16GB DDR3, up to 480GB SSD, optional dual-boot with Windows 7, and a pen tablet interface with 512 pen pressure levels, paper-emulating ForceGlass and 1280 x 800 pixel resolution. The tablet is the follow up of Axiotron's original ModBook, which was never launched because the company was hit by financial troubles following the crash of the US economy in 2008. 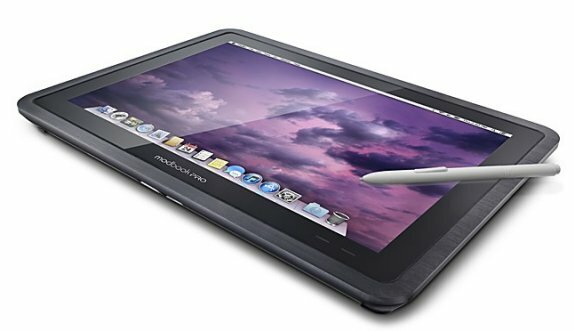 ModBook Inc CEO Andreas Haas claims he wanted to make a pen-based Mac ever since he worked at Apple. He recalls Apple once made a pen-based test device, and remembers how much Andy Warhol loved this prototype. The ModBook Pro has a lot more horsepower than the Apple iPad, and should be better suited for create professionals. The only major downside is the high cost, the tablet has a base cost of $3,499! Shipments will start on or before November 16th. Creative technologies developer Modbook Inc. today announced that customers with shipping addresses in the United States can place orders beginning at 2 p.m. PDT today for the Modbook Pro, the company's innovative 13.3-inch pen tablet computer. To create an easy one-stop shopping experience, Modbook Inc. has opened ModbookShop.com as the exclusive online source to purchase the Modbook Pro. Customers can visit this page and use the dynamic product configurator to customize their Modbook Pro system's processor (up to 2.9 GHz Intel Core i7), memory (up to 16 GB) and internal storage (up to 480 GB solid-state drive), as well as to build out complete single- or dual-display desktop installations, and even to get Microsoft Windows 7 preinstalled and configured as a primary or secondary operating system. The manufacturer's suggested retail price of the Modbook Pro is $3,499. The Modbook Pro is scheduled to begin shipping in mid-November. A unique computer modification product, the Modbook Pro seamlessly fuses the original hardware of a new Apple MacBook Pro 13.3-inch computer running OS X Mountain Lion, a state-of-the-art Wacom Penabled pen tablet digitizer and an etched paper-emulating ForceGlass screen. Each Modbook Pro includes a fast and reliable Nishara-class or Sanshara-class solid-state drive for internal storage, configurable up to 480 GB. Taken together, the Modbook Pro's power, speed, portability and highly sensitive pen input make it the ideal mobile creative workstation. "We're excited that customers will finally get the chance to configure and purchase their Modbook Pro. Each Modbook Pro is custom built to its owner's requirements, and we're confident the time and effort dedicated to the custom build will result in a fun and productive product for customers," said Andreas E. Haas, chief executive officer and chief technology officer of Modbook Inc.
Orders for the Modbook Pro begin today at 2 p.m. PDT. Currently, the Modbook Pro is only available to customers with shipping addresses in the United States. To configure and order their Modbook Pro, customers should go to Modbook Inc.'s online store, ModbookShop.com. Custom configuration options for the Modbook Pro include the choice between a 2.5 GHz Intel Core i5 or 2.9 GHz Intel Core i7 dual-core processor, increased memory up to 16 GB and select solid-state drive options with up to 480GB of internal storage. As the only OS X tablet computer of its kind, the Modbook Pro can be ordered to come preinstalled (via OS X's Boot Camp utility) with Windows 7 as a secondary operating system, or even to boot natively into Windows 7 right out of the box. The dynamic product configurator also allows customers to build out a full desktop setup with up to two standard or Wacom pen-enabled large-screen displays, adding a maximum of 5020 by 1600 pixels (two 2560-by-1600-pixel external displays) to the Modbook Pro's built-in 1280 by 800 pixel screen. Since the Modbook Pro is custom produced and built according to each individual customer's specifications, including the purchase of a new MacBook Pro base system on the customer's behalf, a deposit payment of $500 is required with each order. Customers can cancel their order at any time prior to the beginning of the final stage in the custom build process and receive a full refund of the deposit payment. At the time the final stage of the custom build process begins (12 days prior to scheduled shipment), the deposit payment is no longer refundable and will be applied to the total amount due for the order. The balance due will be charged at that time. All orders for the Modbook Pro will ship in the order in which they are received. Shipments are scheduled to start in mid-November. By submitting an order early, customers have the assurance their place in line is secured. Even though every Modbook Pro is a custom build-to-order product, there is a 30-day "no questions asked" return policy for all systems purchased through ModbookShop.com. A merchandise return fee of 20% is due on all returns other than for repairs or replacements (which are covered by the Modbook Pro's warranty and service plan). Other limitations apply. More detailed information on the return policy is available here. The Modbook Pro comes with a one-year Modbook Pro Protection Plan covering the complete hardware solution, including all of the components of the MacBook Pro base system. Customers will be able to have their Modbook Pro serviced at an authorized service center, the first of which will be announced prior to the time the Modbook Pro begins shipping.